Welcome to the Creganna Resource Centre – a specialized area dedicated to medical device engineers and designers. In this area you will find useful information including design guides, white papers, industry links and engineering information. Updates are constantly made to the Resource Centre to provide you with the best information – be sure to check back. Presented by Creganna at the 2009 Annual MPMD (Materials and Processes for Medical Devices) Conference, this conference paper benchmarks the performance of various materials for catheter and specialty needle applications. Three alternative materials to 304SS are examined and compared using a range of mechanical tests and experimental trials. This paper presents Javelin™ from Creganna – a novel cobalt-chromium (CoCr) based alloy for specialty needle applications. This paper illustrates the superior mechanical properties of Javelin™ over 304 stainless steel in experimental needles trials. The results reported indicate that Javelin™ has the potential to overcome current limitations in endoscopic and minimally invasive surgery. Learn more about Creganna’s Specialty Needle Design and Manufacturing Solutions. In this on-demand webcast, a Creganna Medical Senior Technical Applications Engineer presents an integrated approach for the design and development of sophisticated diagnostic & therapeutic catheters. 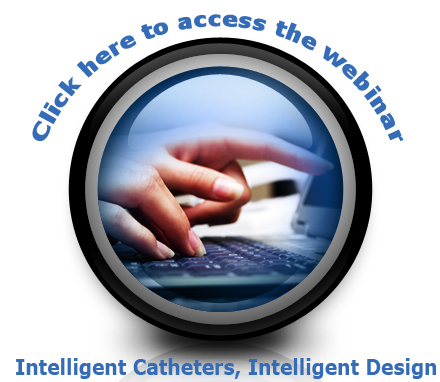 Drawing from extensive experience in the development of such catheters, this webinar explores the unique design challenges presented, details our Top 10 tips for intellignet catheter design and concludes by addressing how intelligent catheter technology may evolve in the future. What prototyping strategy is best to accelerate your product development timeline while also reducing costs? What makes a successful design partnership? A new approach to designing delivery shafts using Finite Element Analysis (FEA) is described in this paper. Employing an FEA approach to design significantly reduces development timelines and assists the product designer to find the optimal, performance-based solution for their delivery shaft. This article examines the growth in the contract design outsourcing market. The benefits of outsourcing product design for medical device manufacturers is outlined. Bench-top testing of a typical catheter is described here to show how early prototype evaluation can decrease product development time. Trackability and pushability are assessed and compared using some novel laboratory tests, which can be applied to a variety of medical devices. Medical Device Technology Magazine, May 2006. A recent study assessing views of interventional cardiologists on the performance of catheters used in angioplasty, also known as percutaneous coronary interventions (PCI), indicates that there is a need for improvement in the catheter. The particular areas of improvement are reviewed here with some hypotube shaft solutions that promise to improve catheter deliverability. Recent research has indicated that shaft design is a crucial element to the functionality of hypotubes. Click on the document below to download the article. This design guide presents the main design characteristics of a hypotube-based device shaft. The guide outlines the key considerations that the design engineer must consider when seeking optimum performance. When designing shafts for minimally invasive devices such as catheters and guidewires, features that improve one area of performance may hinder performance in another area. This article describes how the traditional limits of metal shafts can be extended to enable their use in a variety of new applications. Download this whitepaper now below.